Go Myanmar Tours is very satisfied to conclude that our services are more comfortable and convenient for customers because we provide online credit/debit card payment service for clients. 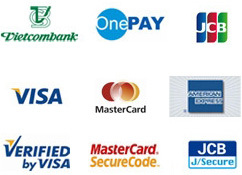 We receive payments from cards executed by or carrying the logos of Visa, MasterCard, American Express and JCB. OnePAY will received directly your credit/debit card information and it is secure even the staff of Go Myanmar Tours. The invoice made by Go Myanmar Tours and OnePay will will be sent to you through e-mail. As completing, an e-mail confirmation and e-mail notifying of your payments will be sent to you. Importantly, please notice that you will have ten days to make the payments from the time you receive the e-mail or else we will cancel the links and the invoice and issue a new invoice. For all on-line transactions, while submitting a payment, you should avoid hitting the ‘pay’ button twice or clicking the ‘refresh’ or ‘back’ button on your browser. If you do not receive a transaction result message after submitting your payment, contact Go Myanmar Tours to see whether they have accepted the payment, or wait to a confirmation e-mail before trying to submit the payment again. According to our service policy, if you pay by credit card, Go Myanmar Tours will count 2% service charge to your entire invoice.